7 August 1861, Promoted to Brigadier General, U.S.V. 1 May 1862, Promoted to Major General, U.S.V. 4 July 1863, Promoted to Brigadier General, U.S.A.
12 August 1864, Promoted to Major General, U.S.A.
General William Sherman’s varied professional pursuits suggest a restless man in search of a meaningful endeavor for himself. His search took him many places, including extensive travel in the South. He was attracted to the South and its people, becoming very familiar with Southern geography and the Southern lifestyle. Eventually, he settled in Alexandria, Louisiana, becoming a respected instructor at the local military academy and a valued member of the community. A staunch Unionist, as Louisiana approached secession, he was compelled to resign his position at the academy. After an emotional departure ceremony staged by the academy’s cadets, he traveled north, arriving in Washington in early March. Initially expressing his desire to have no part in the expected hostilities, he turned down appointment as Brigadier General. Eventually he recognized the impossibility of not becoming involved and accepted commissioning as Colonel, 13th Infantry. His inclination to speak his mind without an appreciation for possible repercussions became fodder for the press. After making several controversial comments, it was suggested in some papers he might actually be insane. Disgusted with the press, disappointed with his superiors, and mistrustful of politicians, it seemed his career might end prematurely. However, he was encouraged by friends, especially his good friend General Ulysses S. Grant, to disregard the criticisms and continue his valuable service. General Sherman once came to the aid of General Grant when he was being criticized publicly. General Sherman remarked: "General Grant is a great general, I know him well. He stood by me when I was crazy and I stood by him when he was drunk; and now, sir, we stand by each other always." It wasn’t long before General Sherman’s aptitude for soldiering was recognized. His actions at Shiloh in April 1862 restored his confidence and started his ascent through the ranks. In 1863, his star continued to rise, and in March 1864 at Chattanooga, Tennessee he was placed in command of the Military Division of the Mississippi. Waiting just across the Georgia line was General Joseph E. Johnston and the Confederate Army of Tennessee. 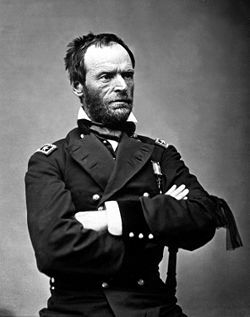 General Sherman’s plan was to strike south into Georgia, engage Johnston’s Army and "break it up." Once General Johnston was eliminated, his intent was to continue south, destroying the war resources of the region. By early May, General Sherman and his force were in motion toward Dalton, Georgia. 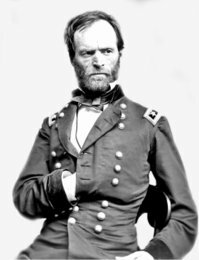 The battles that occurred over the next three months as the Union general pushed ever deeper into Georgia are testament to the skills of both Generals Sherman and Johnston. Both executed campaigns of maneuver. General Sherman’s superior force would engage General Johnston’s men, feint then flank. General Johnston conducted a superb delaying action. He picked good ground, would hold until near disaster, and then fall back to previously prepared positions. In July, as the Confederate Army of Tennessee was forced into the fortifications of Atlanta, General Johnston was replaced by General John Bell Hood. In September, after several costly attacks by General Hood, Atlanta fell. Attempting to draw General Sherman out of Georgia, General Hood and the Army of Tennessee moved north, threatening General Sherman’s supply line. Not taking the bait, General Sherman dispatched a force to follow General Hood, but with his main body, broke away from his supply line and moved southeast toward the coast. General Sherman’s men laid waste to the area that fell within their 50-mile wide axis of advance. With little opposition, his force moved quickly enough to offer the Georgia coastal city of Savannah to President Lincoln as a Christmas present. Having made "Georgia howl," General Sherman then turned his attention toward the last leg of his march, the Carolinas. Sherman's advance is referred to as "Sherman's March to the Sea." Sources: Warner, E.J., Generals in Blue: Lives of the Union Commanders (Louisiana State University Press, Baton Rouge, Louisiana, 1964); Official Records of the Union and Confederate Armies.